For half a century, my mother-in-law, Loretta, has hosted the family holiday festivities in her home every year. I’ve been a part of those celebrations since my husband and I were married. We all come together as a family to enjoy dinner, share our love and laughter and spend time making new memories. This year, our family get-togethers will likely look a little different. My mother-in-law serves as a primary family caregiver for her ailing husband. Hosting dinner is taking a back seat to more important priorities. Last year, I could tell the stress of hanging decorations, preparing food and after-dinner cleaning was a bit too much for her. She seemed overwhelmed, and the joy of togetherness appeared to escape her. It took some coaxing, but my mother-in-law has agreed to make a few small changes to take some of the stress and worry out of our holiday festivities. Families dealing with mesothelioma may benefit from a similar approach to celebrating this holiday season. For caregivers, balancing care duties with additional tasks can be quite complicated. Learning to prioritize tasks, embrace change and focus on celebrating each other may ease some of the added stress the holiday season can create. The holidays represent a time of togetherness. But dealing with cancer can sometimes make celebrating a little overwhelming. Exploring ways to ease holiday stress can offer suggestions to make your family’s celebration more manageable. Family caregivers center tasks on providing care for a loved one. For most, planning holiday celebrations, shopping for gifts and preparing elaborate feasts are not feasible additions to their already extensive to-do lists. It is essential to minimize tasks, focusing only on the most important things such as providing nurturing care for your loved one. Take on a Supervisory Role: If an at-home celebration is a must, allowing another family member to handle the festivities in your home can be helpful. Patients and caregivers can still participate in the festivities, absent the stress of planning, preparation and cleanup. Serving in a supervisory position, my mother-in-law can let others fulfill her duties while still enjoying everyone’s company. Downsize Events: Sometimes cancer treatments weaken patients’ immune systems. Attending crowded get-togethers may increase the chances of unnecessary exposure to germs. It may be necessary to modify the invite list to include only a few guests to reduce germ exposure. Friends and family members will understand and want to make health a priority, too. Modify Attendance: Because transportation is often a caregiver duty, it may be necessary for caregivers to assess travel situations to determine if their loved one is feeling up to attending a celebration. Wintry weather, holiday traffic, health care needs and physical endurance are all issues that may influence a cancer patient’s ability to travel. A live video connection is a good alternative for people with travel limitations. Perhaps one of the most difficult challenges for a primary family caregiver is coping with the many life changes involved with adapting to a new caregiver role. Dealing with the ebb and flow of cancer treatment and related health issues requires caregivers and families to modify priorities and face unanticipated changes. It can be an unnerving time for people searching for comfort while establishing new routines. For Loretta, embracing her changing role as a family caregiver is challenging. As my father-in-law’s health deteriorates, her duties as his caregiver increase. She felt conflicted as she desired a host position, but her caregiver duties are her top priority. Consolidating these conflicting emotions is an anxiety-provoking process that many family caregivers experience during the holidays. It might be helpful to reframe changes viewed negatively to focus on more positive aspects. For example, rather than view an inability to host a celebration negatively, focus on the positive aspects of providing attentive care and having more time to visit with relatives. Another example might be viewing travel difficulties as an opportunity to spend one-on-one time with a loved one. Reframing is a real-life application of the old “silver lining” adage. It takes practice but focusing on positive elements of change can help caregivers embrace the unexpected. Becoming a primary family caregiver may mean stepping away from paid employment and reducing a family’s income. The rising costs of health care further burden the finances of families facing cancer. The financial difficulties that often accompany cancer treatment can make gift-giving during the holiday season a bit worrisome. However, one doesn’t have to break the bank to be thankful, deck the halls and ring in the New Year. 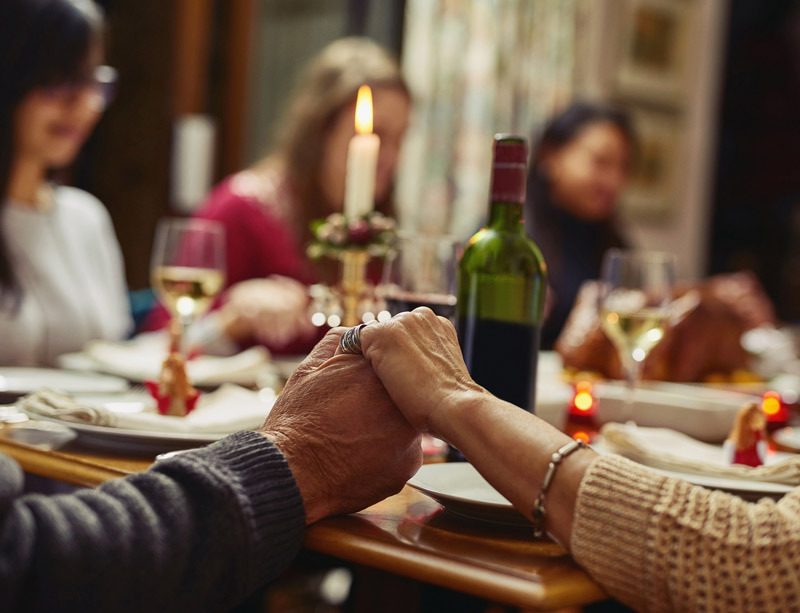 Rooting your holiday celebration in people — rather than things — can help your family focus on what is most important: Each other. Setting price limits for gift-giving or setting a homemade-only rule for exchanging gifts can shift the focus to those attending the celebration, rather than what is inside the box they brought with them. Togetherness is key to a meaningful celebration. One year, my family decided to have an “old to new” Christmas gift exchange. The only gifts we could exchange were meaningful things from the past that didn’t cost anything. I gave my sister an old Cabbage Patch Doll adoption certificate. She opened the gift, then reminisced about times we spent together as children. I received a tattered picture of my father and me, complete with a handmade frame. I was so touched by the thoughtfulness of the gift, I was moved to tears. I’m not sure exactly how the family holiday get-togethers will turn out this year. I cannot replicate Loretta’s amazing cornbread dressing, even with the strict supervision. No one makes chocolate pie quite like Loretta either. But I do know there will be memories made, laughs shared, full bellies and, most importantly, togetherness. Melanie has a master’s degree in clinical mental health counseling from the University of the Cumberlands and a Bachelor of Science in psychology from the University of Phoenix. She maintains a Licensed Professional Counselor Associate (LPCA) licensure to serve families in southeastern Kentucky and is pursuing full licensure as a Licensed Professional Clinical Counselor (LPCC) and a Registered Play Therapist (RPT).